Life’s Abundance Life’s Abundance is a foundational element of our Nutrition Program. 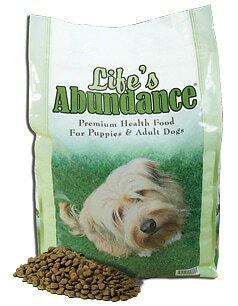 When you pick up your GINGERBRED puppy, we will send home one 3.3 lb sample bag of the Life’s Abundance, which will get you through the first FEW weeks or so. This is the premium food your puppy has been started on, and a ration which we have been very pleased with. To continue feeding your puppy this outstanding ration, we suggest you go ahead and order your first 8lb bag directly from THE COMPANY. If you choose Autoship, you will get our wholesale price. Start with a 6 week shipping frequency. You can adjust the bag size and the shipping frequency at any time. If you run low, it only takes 2-3 days to get it to you, or you can contact me to get you some even sooner. We recommend initially using the 8 bag. This will ensure your pup is getting the freshest possible food. The cost per bag isn’t cheap, but since you feed less per day (since it’s so nutrient-dense), your cost/day is less than most Big Name/Big Hype dogs foods*. …*For what it’s worth, the Labrador Retriever who won both Winner’s Dog and Best of Group at the Westminster Dog Show is on the same GREAT FOOD we’re sending home with your puppy. LIFE’S ABUNDANCE PHONE NUMBER IS 877-387-4564 They will ask you for an ID#. That number you should use is 20050438. We give our dogs a Genetic Advantage… Give your puppy a Nutritional Advantage. puppy will live a Longer, Happier & Healthier Life. Note: Remember to Order your food ‘before’ your puppy arrives home! I recommend ordering an 8 lb Bag and to “Autoship” about every 6-7 weeks. Powerful Antioxidants like Pomegranate Extract Pure Digestible Protein Sources Chelated Minerals for 40% better absorption Five Different Live Probiotics (friendly bacteria) Omega 3 Fatty Acids for a healthy skin and coat FRESH FOOD made weekly. Made in an APHIS certified USDA Plant NEVER Been Recalled LIFE’S ABUNDANCE PHONE NUMBER IS 877-387-4584 They will ask you for an ID#. That number you should use is 20050438. We highly recommend giving your dogs NuVet supplements. highly recommend NuVet Plus. I give it to ALL my dogs the wafers daily. I’ve seen some amazing things in my day, but this takes the prize. It is the best nutritional supplement I’ve ever seen. I recommend it to everyone. More than a million dogs and cats are using NuVet to protect against most ailments (from backyard pesticides, pet food allergies and hormones, toxic formaldehyde in furniture and carpeting, ailments transmitted from dog parks and the vet’s office, etc), while maintaining beautiful skin and coat. For younger dogs (under 2 years old), it strengthens the immune system, while building and strengthening the cardiovascular, skeletal and nerve systems. For dogs in their prime (age 2-8), it improves the luster of the skin and coat while protecting against allergies, skin and coat problems, staining from tears, digestive problems, etc. 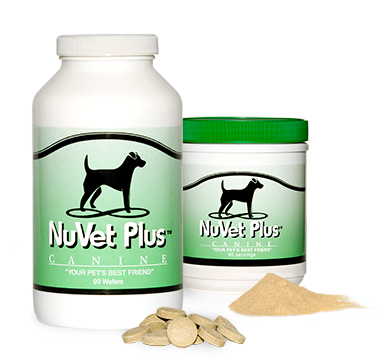 NuVet Plus can help prolong the life of your dog and cat And can help eliminate most ailments GUARANTEED! We highly recommend NuVet Plus to keep your pet on the path to perfect health! It’s not available in stores. For your convenience, you may order directly from the manufacturer by calling 800-474-7044 and using Order Code: 10806, or ordering online at www.nuvet.com/10806 . By using autoship you can save an additional 15%. Read their testimonials, and you will see why I recommend this. I have seen some of these great improvements with my own eyes.